June | 2013 | A Bit of Nutmeg! Place foil on the baking sheet and spray it with Pam. 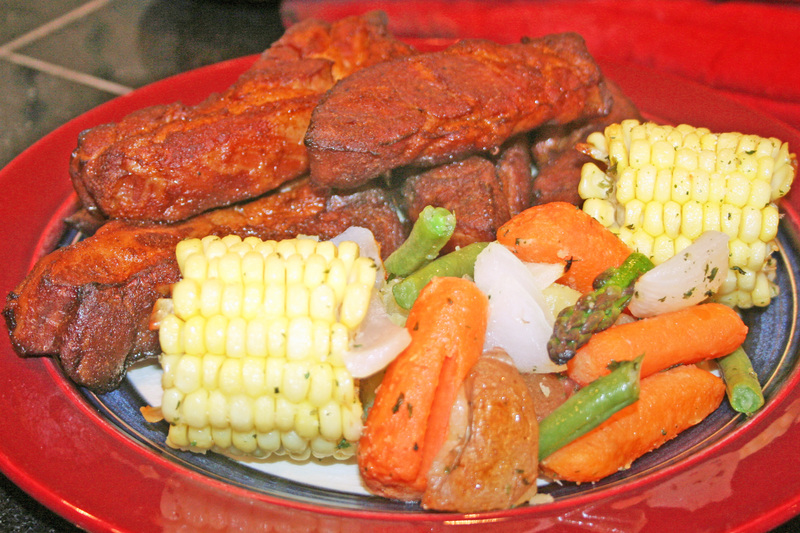 Combine rub spices and cover ribs on each side. Place on pan. Cover tightly with foil and bake at 250F for 2 hours. Turn the ribs over, re-cover with foil and bake another 2 hours. Place ribs on a new foil-lined pan and bake uncovered at 400 for 20 minutes. Vegetables: Steam potatoes, carrots and corn for 10 minutes in a steam basket. Drain and return to pan without the steam basket. Add the green beans, asparagus and sweet onions to the pan. Drizzle with oil and sprinkle with lawry’s garlic spice mix. Place on foil-lined baking sheet sprayed with Pam and bake at 400 for 15 minutes.